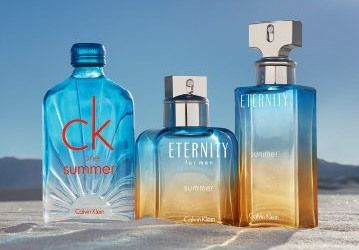 Calvin Klein will launch the annual limited edition summer versions of 1988's Eternity, 1989's Eternity for Men and 1994's CK One in March. This year's collection was "inspired by the idea of a couple in the middle of the desert enjoying the heat of the sun before the cool of the night" (Eternity) and partying at desert festivals (CK One). Eternity Summer for women ~ a fresh floral with desert rose, bergamot, saffron, watery accord, vetiver, sandalwood and skin musk, in 100 ml Eau de Parfum. Eternity Summer for men ~ a clean fragrance with desert sage, ginger, jasmine, violet leaf, sandalwood and salty musk, in 100 ml Eau de Toilette. CK One Summer ~ with lime, citron, cucumber, "fiery pepper trio" and saffron, in 100 ml Eau de Toilette. I wonder what will be in store now that Raf Simons has taken over the reigns at Calvin Klein, which apparently also includes fragrances. It could use some streamlining and a little bit of risk-taking. So far have seen very little evidence that new creative directors have any huge impact on fragrance lines other than in terms of presentation. It does happen, but not very often! Since he demanded and has gotten complete creative control over everything bearing the Calvin Klein label – including fragrances – who knows? Hopefully it will be more than just presentation. Speaking of, the CK One Summer bottle most certainly would have looked quite different under Raf’s direction. I gotta get on the ball….I think I only used the 2016 summer CK One edition once or twice! LOL! Well that will last you then!